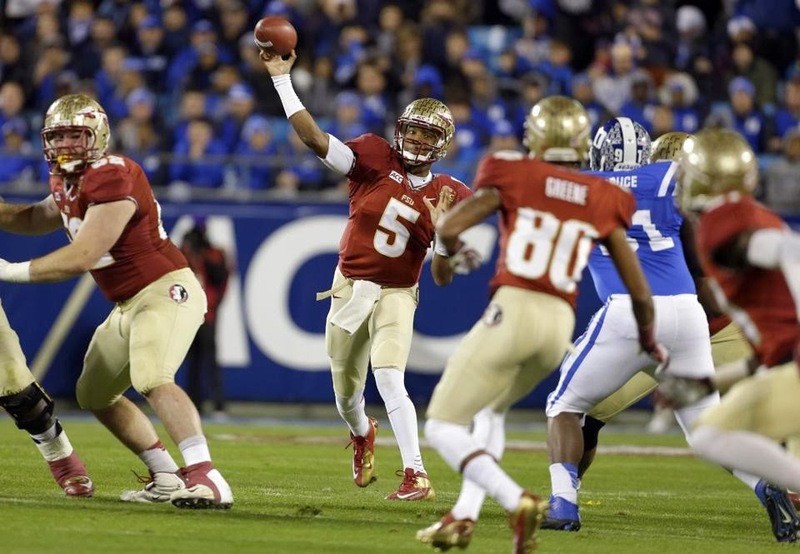 Is there any chance Jameis Winston does not win the Heisman? This Saturday, the Downtown Athletic Club will present the winner of the 2013 Heisman Trophy to one of six finalists, the first time the number has been that high since there were six finalists in 1994. The finalists are Northern Illinois quarterback Jordan Lynch, Texas A&M quarterback and defending winner Johnny Manziel, Alabama quarterback A.J. McCarron, Auburn running back Tre Mason, Boston College running back Andre Williams and Florida State quarterback Jameis Winston. Winston is considered to be the heavy favorite, but could we witness an upset with the presentation? Let's be honest here, Winston is going to be the Heisman Trophy winner for this year, it is all but a foregone conclusion. The only moments of doubt where with the investigation into the sexual assault charges on Winston which were, rightly or wrongly, not pursued by the state attorney's office. If Winston had been charged, then there would be a real discussion over who would win it, but considering his incredible season in which he has been brilliant from day one in leading Florida State to the BCS National Championship Game, it basically is going to be a race for second place. If legal troubles did not hinder Cam Newton in 2010, they won't hinder Winston in 2013. All of the other finalists have legitimate cases to be made that they should be the runner-up, and yet each has flaws as well. Lynch was an incredible dual-threat quarterback all year and he has a chance to join the extremely rare 2,000-2,000 club, but he noticeably struggled in the MAC Championship with a BCS bid on the line agianst Bowling Green. Manziel just may have had an even better season than his campaign of a year ago, but with the Aggies taking a step back thanks to their pitiful defense, as well as some folks tiring of the Johnny Football narrative. McCarron had the case of having an excellent season as the focal point of the Alabama offense, but with the Tide losing to Auburn in the Iron Bowl as well as McCarron not even being the most deserving on his own team in my opinion (would rather see C.J. Mosley in New York), that hurts his bid. Mason is an intriguing case as he was awesome as he helped the Tigers en route to their title game appearance, but may it be a case of too little too late? And for Williams, who has been an absolute horse in leading Boston College to their first bowl game since 2009 by leading the nation in rushing and putting up an insane five games of other 200 yards rushing, but he did noticeably struggle in the finale against Syracuse. Isn't it disappointing that we are going into a Heisman presentation arguing over who will be second? Regardless, barring an epic surprise, Jameis Winston will be hoisting the trophy.